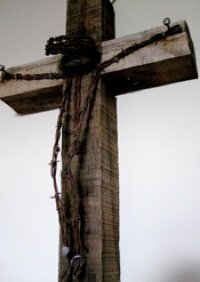 Jesus on the cross - what does that mean to you? Jesus on the cross is an unforgettable, graphic portrayal of my past, enmeshed with the hope of my future. I remember my first, faltering steps into understanding what that supreme sacrifice meant for me. You too, I’m sure, remember the overwhelming sense of gratitude and relief. Your sins were forgiven, and you were set free. Jesus on the cross is a poignant image, provided by God, for all humanity. In powerful, vivid detail, it remains a lasting visual of what was won at great cost, for each of us. We look at it and remember His free gift of eternal life. I am always intrigued by God’s use of imagery in the Bible. The Bible was written over hundreds of years, compiled of sixty-six books by forty authors, from diverse backgrounds. In spite of it, the Bible stands as a cohesive, literary whole with imagery that is consistent throughout. The reason for that, is the Holy Spirit, who is the author of all creative imagery. The familiar word pictures of bread, wine, oil, blood, shepherd, lamb… are consistent in their symbolism and meaning, whether they appear in Genesis, Jeremiah or Revelation. 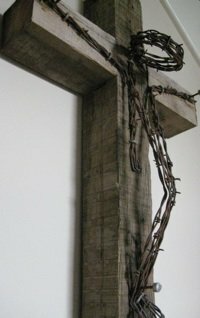 Jesus on the cross is a powerful image, with meaning that stretches back over time, years before He was actually nailed to the cross. Not surprisingly, it also stretches forward, years into the future, with rich meaning for you and me. His broken and bruised body on that cross was lifted up in all its horror, providing us much needed transformation. It is ours only when we trust His sacrifice. Jesus on the cross is a vivid portrayal of penalty that was due us. As Christian artists, let image of Jesus on the cross be a reminder of what He won for each of us - the freedom to boldly approach the Father. This same Holy Spirit has been provided as our helper, to guide us into all truth. Can you think of any better creativity coach? Remember His role at Creation –‘ hovering over the surface of the deep’ … All creativity dwells in Him. And He has invited us into a intimate relationship – to inspire, teach, guide and encourage us along. Isn’t that exciting! None of this would have been possible without the awful sacrifice of Jesus on the cross. How can you, as a Christian artist, appropriate these truths in a practical way? Begin all creative endeavors, no matter how small, with a quiet invitation of His presence. Remember His closeness to you came at a costly price. Hold the precious image of Jesus on the cross in your mind's eye. He has now asked you to witness about the joys of belonging to Him. Trust that He always honors His promises. “You O Lord, keep my lamp burning: My God turns darkness into light” Ps: 18:28. Can you see how different your art will be, than work created by heedlessly jumping into the creative process? The little pause before I begin, has yielded for me, all the rich fruit of a 'Selah', or rest, as described in the Psalms. It has given me direction, ideas, energy and so much more! He has helped me faithfully, and He will lead and guide you too. As a note of caution, I would like to warn you. When you find success because of His help, beware of raising yourself up in pride. There is only room for Jesus on the cross. The image of either of us on that cross, is not an encouraging one! Faithful Cross A store of unique Christian gifts. © Copyright 2018 www.christian-artist-resource.com All rights to written and graphic content reserved.